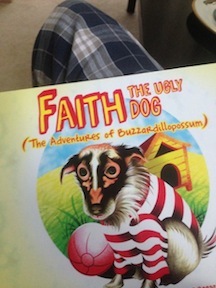 Faith the Ugly Dog books arrived today! December 6, 2014: Yay! So excited that the books finally arrived today–all 1,025 of them! 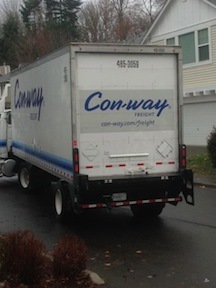 There were a total of 31 boxes on a large pallet that were delivered by Con-way Freight. The driver was so kind. Since I had no room in my garage to store the boxes, he brought them up and sat them on my porch, two boxes at a time. I then transferred them from the porch to a corner of my living room, where I’m pretty sure they will stay for a while. Truck with my books in the back. 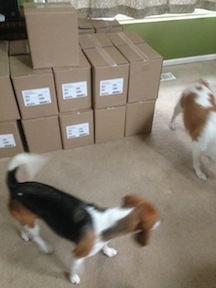 My dogs, Yggam and Nelly were very excited about the boxes and performed a thorough inspection. I assume that they passed the intense scrutiny of two Beagle noses. I actually cried when I held the first book in my hands. Sad tears because my sweet Faith is not here to celebrate, but also happy tears because she will live on forever through her inspirational story. I am so lucky to have been her mommy for five years. She changed my life and will hopefully change the lives of others as well. The first time I held the book in my hands, I cried. Now it’s time to go to work to ship the books to everyone. It will truly be a labor of love and I am looking forward to sharing Faith’s story with the world–although I guess I’ll start off by sharing with friends and family who ordered the books.